In pursuit of economic opportunity, many Nigerians have moved from rural to urban areas. As a result, the proportion of Nigerians living in cities has risen from 19 percent in 1975 to 46 percent in 2013, leading to a rapid physical expansion of urban areas (UN, 2015). The growth of the city of Ibadan is a good example of the urban sprawl seen in cities throughout Nigeria. Ibadan was once a military stronghold of the Yoruba Empire, dating back to the 16th century. Ibadan’s growth was spurred by a connection to the railroad in 1901, which cemented its role as a major trading center of agricultural goods produced in the surrounding region, such as cassava, cocoa, cotton, rubber, timber, and palm oil. Today, Ibadan is a vibrant commercial, industrial, and administrative center, which hosts chemical and electronic industries, motor vehicle assembly plants, and a number of other industries, including flour milling, leather working, and furniture making (Fourchard, 2003). Until 1970, Ibadan was the largest city in sub-saharan Africa (Fourchard, 2003). Population figures are sparse but suggest a population of 847,000 in 1975 rising to about 2,790,000 in 2013 (UN, 2015). According to the land cover maps the city’s built-up area increased from 84 sq km in 1975 to 528 sq km in 2013. New development occurred particularly along the major road axes, such as the Ibadan-Lagos expressway to the south of the city and the Eleyele expressway to the northwest. By 2013, the cities of Moniya and Agudu were already parts of the Ibadan metropolis. If the present rate of expansion continues, surrounding towns such as Idi Ayunre to the south), Ikire (to the east), Fiditi (to the north), and Ilugun (to the west) will be linked to the built-up area of the sprawling metropolis. 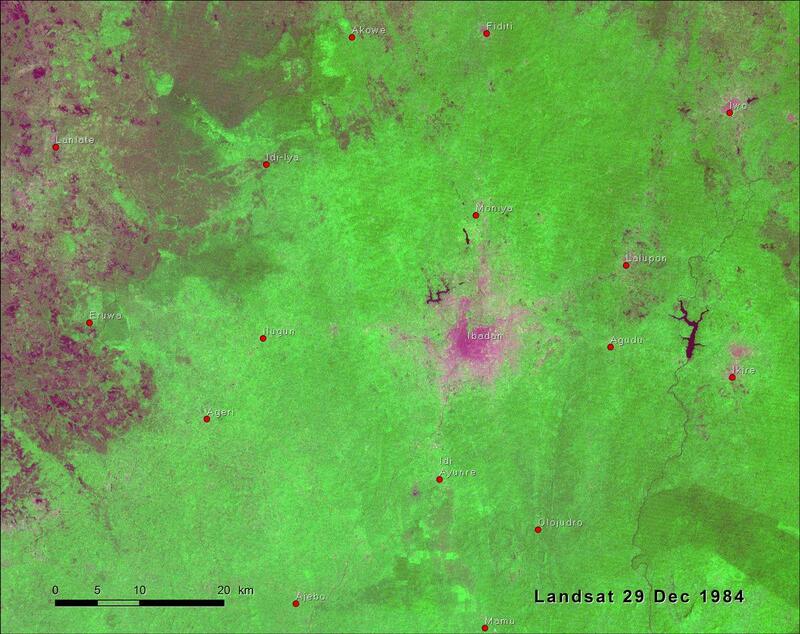 The rapid sprawl has eaten into forested areas, savanna, farmland, fallow lands, and river floodplains. Forests and wetlands have been degraded. 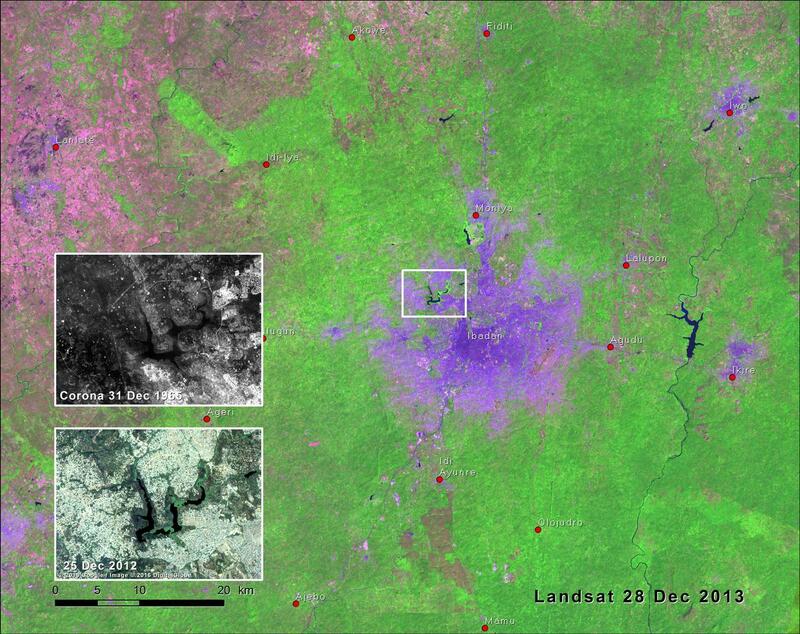 In the Eleyele wetland — a modified natural riverine wetland in the northwest quarter of Ibadan — an estimated 66 percent of the wetland riparian forests were lost between 1984 and 2014 due to the urban expansion (see inset). Waste effluent discharge from the city also contributed to deterioration in water quality (Tijani, Olaleye and Olubanjo, 2012). Like other cities in Nigeria and the developing world, Ibadan has been growing at a very rapid rate, but the provision of social services and basic infrastructure has not kept pace. Unmanaged urban growth and haphazard development of informal housing have resulted in a gradual deterioration of the environment and a decline in the quality of life.